Microsoft has activated the Clutter folder by default in Office 365 accounts. Clutter is based on machine learning and relies on user behavior to identify and remove low-priority emails from the Inbox. 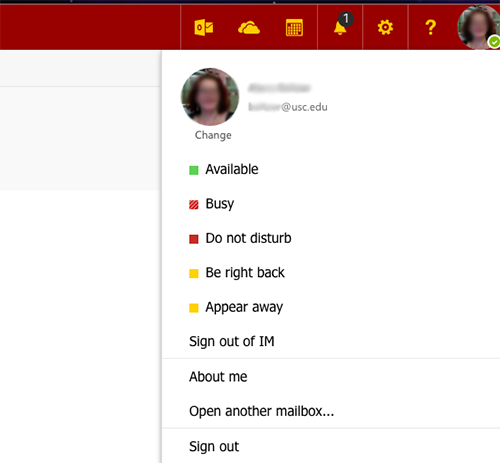 For example, if a user consistently does not open messages from a specific sender, messages from that sender will be moved into the Clutter folder automatically. Users can review these messages at any time by opening the Clutter folder. Unlike the Junk E-Mail folder, which stores spam and obeys the same rules for all account holders, the Clutter folder is for legitimate messages that are considered low-priority based on an individual user’s behavior. Information about how to train Clutter to filter messages more accurately or to deactivate the feature on your account is available on the Microsoft support site at support.office.com/en-us/article/Use-Clutter-to-sort-low-priority-messages-in-Outlook-7b50c5db-7704-4e55-8a1b-dfc7bf1eafa0. How do I share documents with non-USC colleagues? For information on sharing documents from your ITS-supported Office 365 account with non-USC colleagues and others that do not have ITS-supported Office 365 accounts, see the Share a document or folder by inviting people section of Microsoft’s Share documents or folders in Office 365 documentation. NOTE: External users will need to have a Microsoft account, such as an Outlook.com, Hotmail.com, or XBOX Live account to successfully access the OneDrive for Business files you share with them. How do I upload documents to OneDrive for Business? Can I edit documents within OneDrive for Business? You can edit files within OneDrive for Business using the web app versions of Microsoft Office programs, including Word, Excel, PowerPoint, and OneNote. To open a file within OneDrive for Business, click on the file name and choose “Edit Document” and then “Edit in Web App” from the top menu bar. When you share a document with another user, you can choose whether to give that user editing rights. OneDrive for Business will remember the ten most recent versions of edited documents. Can I edit documents simultaneously with other people? Using the online version of Microsoft Office, you can also collaborate and work on documents at the same time as your colleagues. See Microsoft’s Use Office Online To Work Together in Office 365 documentation for details. How do I manage and share documents stored in OneDrive for Business? For information on appropriately managing your file-sharing settings, see Manage Your File-Sharing Settings in OneDrive for Business. You can upload most document file types. For security reasons, you cannot upload applications. Can I access my OneDrive for Business files directly from my desktop computer or mobile device? If you use the built-in IM function of OWA, you will only be able to contact users with ITS-provided O365 accounts. 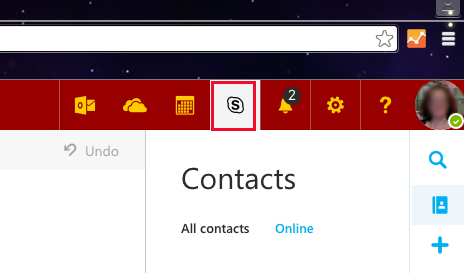 If you wish to contact non-USC colleagues or other commercial Skype account holders, you will need to use the Skype for Business (Windows or Mac) client. See the Microsoft webpage below for information on how to do this. You can set your status or sign out from the menu shown in the screen shot below. This menu is accessed by clicking your profile picture in the upper right-hand corner of the OWA window. You may also access Skype for Business through a desktop client on a Windows PC or through a mobile device. See the links below for information on downloading these clients. Click the gear in the upper right-hand corner of the browser window. From the pull-down menu that appears, select Office 365 settings. On the Office 365 settings screens, select software. From the Software menu, choose Skype for Business. Follow the instructions on this screen to download and install the latest version of the Skype for Business or Lync client available for your operating system. Click the links below while on your mobile device to access the app store and download the Skype for Business client.